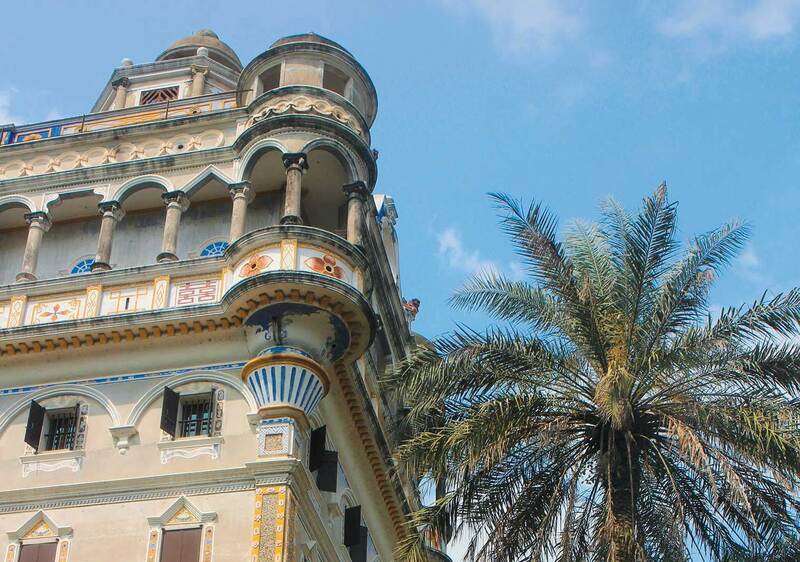 Arguably the most ornate of Kaiping’s diaolou, Ruishi Lou towers over the village of Jinjiang Li. 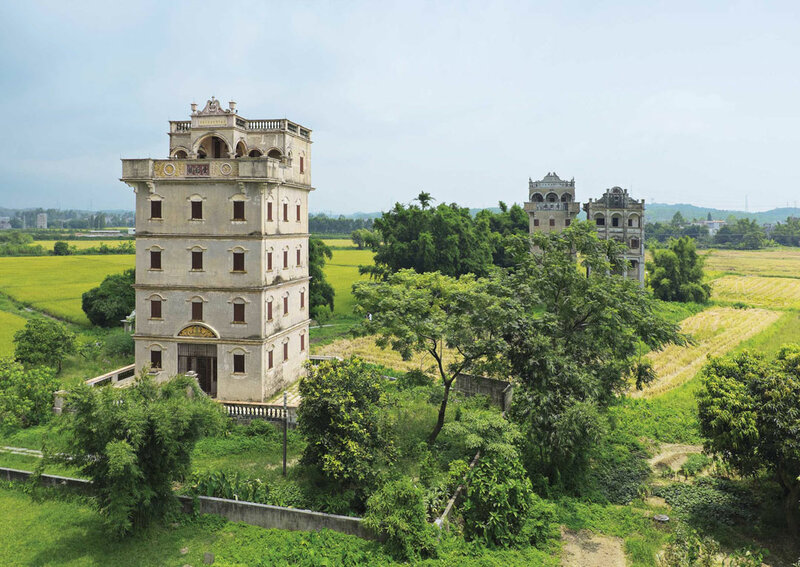 From the arcaded, movie-set-worthy streets of Chikan to the remarkable watchtowers that dot the countryside, the unique architectural legacy of Guangdong’s Kaiping County begs exploration. I was standing at ground zero of China’s meteoric three-decade boom. With multi-layered highways snaking their way through a skyscraper jungle, it was hard to believe that this had once been rural land, dotted with ancestral halls, Taoist temples, and close-knit clan villages. 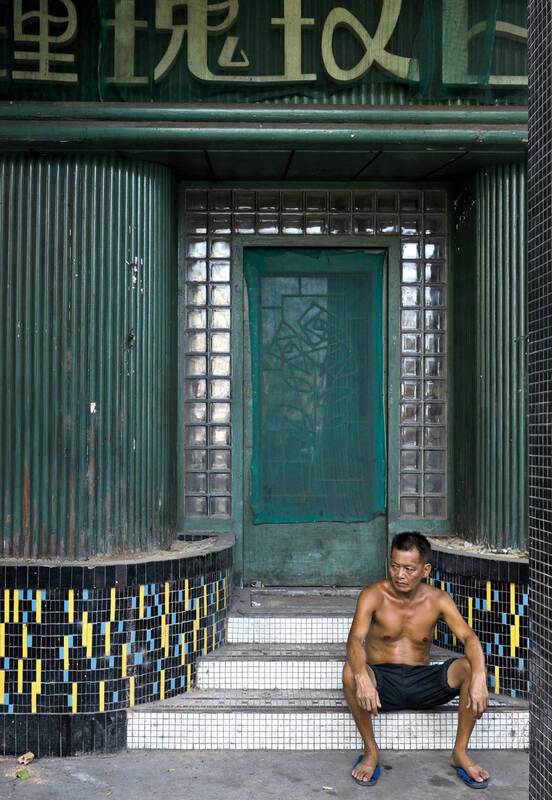 Old Canton, long synonymous with opium and vice, had emerged from its socialist slumber as Guangzhou, the sprawling capital of China’s industrial deep south. Soon my travel companions from Beijing—a graduate student named Danny Parrott and his effervescent girlfriend Lisha Tang—made their appearance. Lured by the promise of pastoral countryside and a singular architectural legacy, we hopped aboard an intercity coach that would take us westward through the manufacturing suburbs of the Pearl River Delta. Much of Chikan’s architecture dates to the 1930s. Our arrival at Kaiping City’s cheerless bus station a few hours later, however, deadened the air of expectation. Every billboard in town seemed to advertise water faucets of one kind or another. “They’re clearly in the tap business,” Danny said. Thankfully, we were headed to the old town of Chikan, 12 kilometers south of the city center. Lisha quickly negotiated a fare with a portly, Zhongnanhai cigarette–smoking taxi driver and ordered us into the back of the cab. As soon as we broke free of the grubby city limits the scene metamorphosed into one of luminous rice fields peppered by the remarkable structures known as diaolou. To understand Kaiping’s unique appeal requires a brief explanation. The province of Guangdong, long considered a peripheral player in the grand Chinese drama, was wrenched onto the main stage after trade winds delivered Europeans to its shores in the 1600s. These gwailo (“ghost men”)—as the Cantonese dubbed the interlopers—brought along an influx of novel ideas. Be they religious, scientific, or, in the case of opium, addictive, all were abrasive forces on the fabric binding the Qing Empire together. As circumstances unraveled the region plunged into chaos, prompting enterprising Southerners to head overseas to try and reverse their misfortunes. Many emigrated from Guangdong’s impoverished Sze Yup (“Four Counties”) region, of which Kaiping is a part. These émigrés built railroads, mined for gold, and opened restaurants, which comprise the core of Chinatowns to this day. Some filial sons came home, their pockets brimming with dollars, their minds filled with occidental pretentions. And out of this newfound wealth came the aforementioned diaolou, fortified residences and watchtowers that blend Western and Chinese architectural styles. Today some 1,833 of the original 3,000 diaolou still dot rural Kaiping. They have survived the destructive excesses of the Mao years and the ravages of the southern climate, an enduring testament to a half-forgotten chapter in the annals of globalization. For Danny, Lisha, and I, arriving in Chikan was like traveling back to the early 20th century. 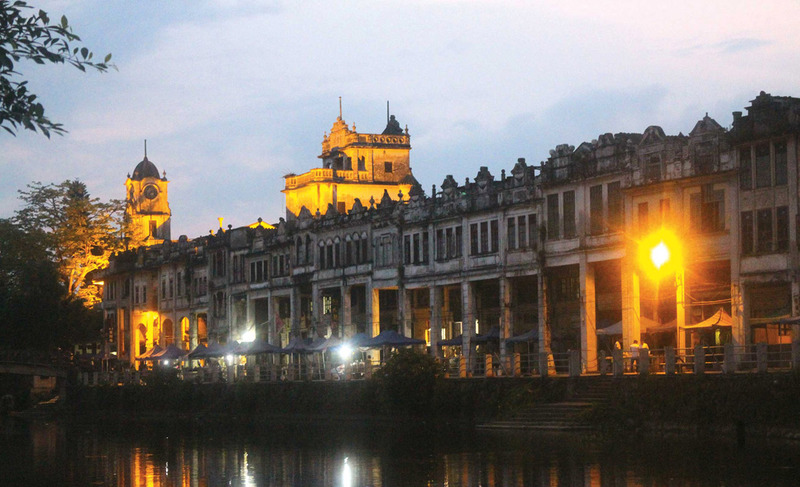 Flanking the muddy Tan River, the town possesses some of the best qilou—Nationalist-era arcades—anywhere in the province, making it a ready-made film set for period pieces such as Let The Bullets Fly and The Grandmasters. before stepping out for a stroll. Crossing a nearby bridge brought us to an old, well-preserved library topped with a clock tower. The Situ clan, one of two families that dominated Chikan after its founding in 1649, had built it. The rival Guan clan was responsible for the buildings on the other side of the river. Next door, a lustrous quarter of town was cordoned off from prying tourists by a large gate. This, I later learned, was the Lingnan Film Studio, where scores of historical movies have been shot. Yet it was exploring the backstreets that proved most rewarding. Though a few of the decaying old houses have been converted into cafés or antiques stores, Chikan remains a lived-in locale, with residents gossiping on street corners and chickens stalking the cobblestones. After sunset we found an open-air restaurant by the river that served local delicacies—Lisha particularly enjoyed slurping river snails from their shells. Over bottles of Guangzhou-brewed Zhujiang lager, Danny wondered out loud why Kaiping hadn’t succumbed to the rampant commercialization that typically befalls Chinese historical sites, especially those inscribed on the UNESCO World Heritage list. We would ponder that for the rest of the trip. The next day, knowing that my companions would sleep beyond noon, I set out on a bicycle to explore the diaolou alone. My first stop was Sanmenli village, home to the oldest one of them all: Yinglong Lou. 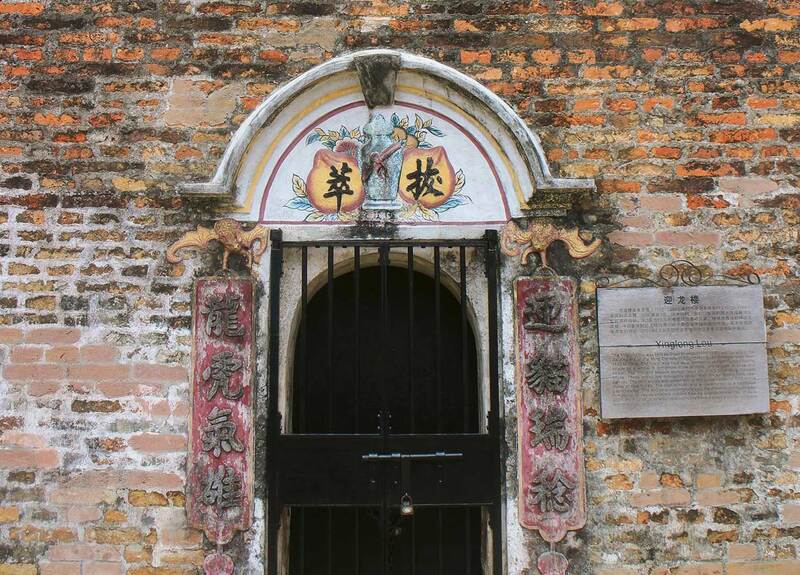 Located down a network of narrow streets flanked by equally venerable-looking houses, the squat, thick-walled brick structure dates to the early Ming period, when it was built by a Guan clan patriarch as a communal refuge against marauding bandits. But its door was barred shut, and so, like some brigand from the past, I had to content myself with the views from outside. The locked entrance to Yinglong Lou, a fortified refuge built in Ming times. 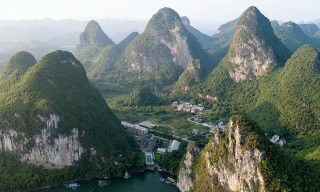 Beyond Sanmenli I pedaled past a traditional fishpond, some sacred banyan trees, and burial sites into glorious open countryside, the diaolou appearing as islands adrift on a sea of whispering green. But as the sun grew stronger and gradually sapped my energy, I returned to Chikan, opting instead to visit more distant attractions by bus. About 20 minutes southwest of town, the village of Jingjiang Li has the most bizarre cluster of fortified towers. 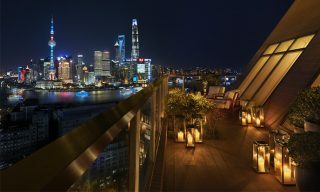 Among them, Ruishi Lou best epitomizes the mélange of styles that defines diaolou architecture. Constructed in 1923 by Huang Bixiu—a villager who’d found success in Hong Kong as a merchant—it sports domed Renaissance-style turrets at each corner, baroque pediments, and ornate Chinese iconography. The name, which means “auspicious stone house,” is inscribed in bold black characters on a lintel above the arcaded veranda, while yellow and blue phoenix motifs adorn the upper levels. “Or perhaps it’s just impossible to get them all in one place for a serious meeting about developing the region,” I replied. Danny and Lisha had spent the afternoon visiting various diaolou clusters by taxi. Ever looking for the next business opportunity, Danny had cultivated the idea of opening a guesthouse. “They said it’s just 2,000 yuan a month to rent a whole tower! I might move here after I graduate and learn Cantonese.” Lisha, a northerner who didn’t adapt well to the humid southern climate, seemed less enamored with her partner’s latest get-rich-quick scheme. 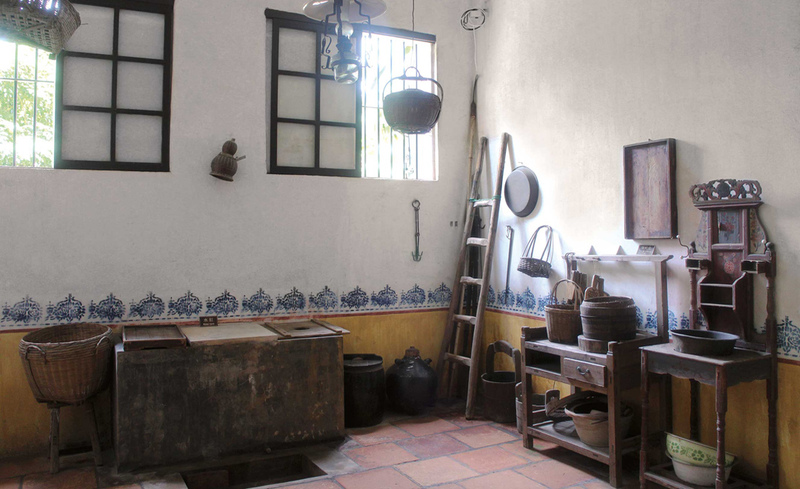 An old-style villa kitchen in Ma Jianglong village. I ended my tour with a sunset visit to the village of Zili, just north of Chikan. This cluster of Qing-dynasty watchtowers could have constituted a scene from medieval Europe, were it not for the boggy rice fields that surrounded them. It was Zili that adorned Kaiping’s tourist paraphernalia, and the village’s fame had brought the inevitable trappings of mass tourism: an expensive admission fee, garish walkways, and stores selling tchotchkes to groups of snap-happy sightseers. Despite all this, Zili struck me as a living, breathing place, still inhabited by the 63 families that called these remarkable towers home. Content that something of old Guangdong survived even here, I walked back across the twilit rice fields and caught the last bus bound for Chikan. One of a cluster of diaolou in the fields of Zili village. Kaiping is a two-hour bus ride from Guangzhou’s Fangcun Station, on Line 1 of the Guangzhou Metro; coaches depart several times a day. old Wanda Realm Jiangmen (86-750/387-7777; doubles from US$100) is undoubtedly the closest international-standard hotel to Kaiping’s diaolou-dotted countryside. This article originally appeared in the February/March 2017 print issue of DestinAsian magazine (“Period Drama”).